Rapunzel wants to have a hipster look, but is not sure what to wear to look like one! Can you help Rapunzel and give her a hipster outfit? Princess Merida is brave and adventurous girl. She hardly cares for her outward appearance that she ends up looking tomboyish. 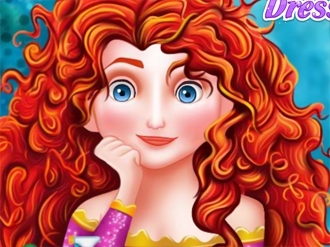 Today, let us make Merida look like a real princess with a gorgeous makeover and makeup. Pamper Merida with facial creams and make her face clean and clear without any flaws. Then apply makeup to her face and choose elegant accessories and outfits. Princess Merida will surely like her new makeover that you have given her. Have fun! When the dwarfs are out and about, Snow White has to clean the house, because they always leave quite a mess. Snow White would really love some help with the work load for the day, because she would like to surprise them and redecorate the house as well. Princess Jasmine’s life in the royal palace of Agrabah used to be so dull and colorless, she had no friends except for her father and pet tiger Rajah… until one day she met Aladdin! Now she’s got not only the love of her life, but also a good friend - cheerful and funny Genie! Jasmine is so happy! She wants to do something good for her new friend and the first thing that came to her mind was to clean up Genie’s lamp. It’s his home after all, and the place where he spends most of the time must be cozy and clean. So let us help Princess Jasmine clean up the interior of Genie’s lamp. Give the place a total makeover and make it look tidy and fresh. Before we get started, we need to equip ourselves with all the necessary cleaning utensils – just rub the lamp and they will come out of it one by one. After that you can start your work with cleaning out all the trash and placing all the dirty clothes to the laundry bin. Finally, grab paint buckets and brushes and make the place look fresh and bright! Genie will absolutely love it!